The Caesar Park Ipanema is located in the heart of the residential district directly in front of the famous Ipanema Beach. 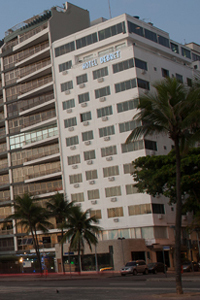 A five star hotel, and also a member of The Leading Hotels of the World, the Ceasar Park Ipanema offers excellent services including 24 hour rooms service, safe deposit box at the front desk, bar, coffee shop, convention center, lounge, business center, restaurant, and convenience shops. All 222 rooms feature alarm clocks, telephones, cable TV, fax, internet access, iron and ironing board, and a mini-bar. The hotel also has available for the guests a fitness center, sauna, massage room, swimming pool, and bicycles upon request at the front desk. When would you like to stay at Caesar Park Ipanema Hotel ? 1) Rates at the Caesar Park Ipanema Hotel may not be valid during Carnival, New Years, Easter and other special dates.